All you Marvel & Superhero fans out there, ever dreamed of being a part of the espionage and law-enforcement agency of the Marvel Comics Universe, S.H.I.E.L.D. ? I’m not quite sure about you people, but I dream of it every time I watch something related to Marvel or Superheroes. Expecting to turn into a Superhero due to some chemical reactions or weirdo scientific experiments is a very high expectation. So, why not be a part of the agency who deals with these Superheroes. If you can’t get there, at least try & get close. Recently, I’ve been watching Marvels’s Agents of S.H.I.E.L.D. & it has certainly got into my head. The work done by the makers of this TV series is fantabulous & they deserve all the appreciation. Marvel masters at this skill of building up links between their whole Cinematic Universe & they always keep us thinking what will happen next? Coming to the point now, I don’t know whether I can ever be a part of S.H.I.E.L.D. or not? 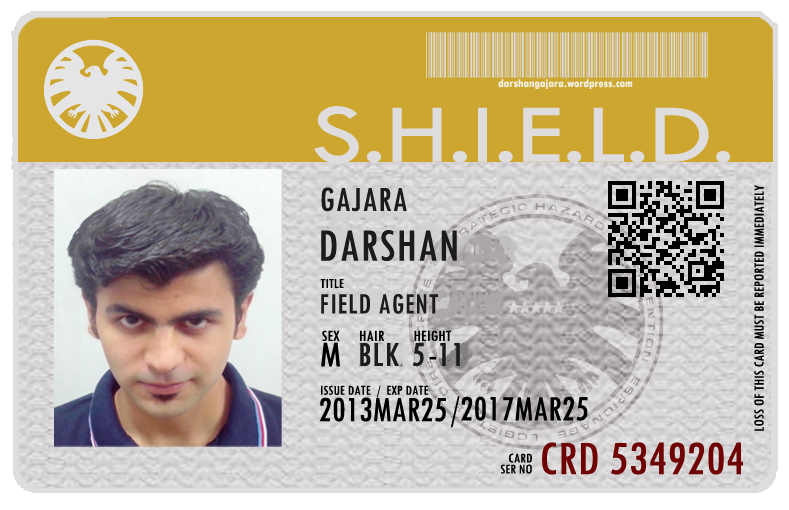 That means I’ve to wait for indefinite period of time to get hold of my own S.H.I.E.L.D. ID Card. Even Skye had to wait 15 long episodes to be awarded her S.H.I.E.L.D. badge. So, why not bring my Photoshop skills into picture? I did bring it in, a little of Photoshop work & my own S.H.I.E.L.D. ID Card is ready. With little or no Photoshop skills, you can design your own S.H.I.E.L.D. ID Card. Download the Photoshop (.psd) file from here. You just have to edit the text layers to match your credentials & yeah, edit the photo layer & replace it with your desired photo. Execute these little steps & your S.H.I.E.L.D. ID Card will be ready in no time. So, what are you waiting for? I’m dying to call you my fellow Agent. By the way, you can call me Agent DG. You can also make your customized S.H.I.E.L.D. ID Card by visiting this website. Shared link is a web app where you’re supposed to provide just your details & a supported photograph. Everything else is done by the app itself. I thank Craig Fifield for bringing this awesome stuff to my notice. Bonus: Click here to create your HYDRA ID Card. Hail HYDRA!